Home Sports Small Ball: Lonzo Ball comes up small in Elite 8. There was large concern that all of LaVar Ball’s talking would get his more humble son in trouble and turn him into a target. We got the first glimpse of that as De’Aaron Fox (of Monk and Fox) and the Kentucky Wildcats first dominated, then dismantled Lonzo Ball and the 3rd seeded UCLA Bruins. The Bruins won their first meeting versus UK 97-92 but that was nine games into the season. 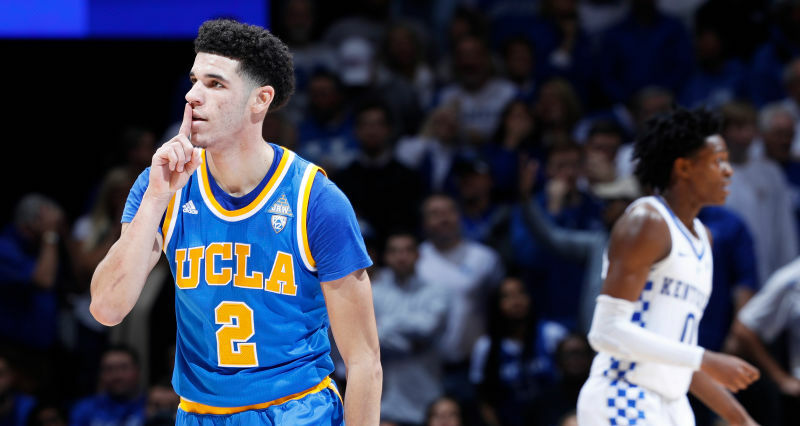 Friday evening was a different story as Lonzo Ball’s counterpart De’Aaron Fox set the all-time NCAA Tournament scoring record for a freshman with 39 points. Malik Monk finished with 21 pts on 4/9 shooting from 3pt land including some long range bombs that really helped spread the Bruins defense allowing Fox to do his thing towards the basket. So with Lonzo finishing with an unimpressive 10 pts on 4/10 fg (1/6 3pt) 8 assists and 4 turnovers, the undeniable question arises whether or not father LaVar’s media take over the last 2 weeks affected his son. I would be the first to quickly say no, but this is definitely something to watch. In a game of inches both physically and mentally, you have to wonder how Lavar’s antics effect son Lonzo’s preparation, attitude and demeanor. I’ve watched footage on ESPN and they really seem like they have a close, tight knit family that is actually very likable. At the same time Lavar’s influence reached new heights this past week with comments that began Lonzo being better than 2-time MVP and NBA Champion Stephen Curry, led to demanding a Billion dollar shoe deal money up front, continued with “I never lost a game 1-on-1 and could’ve beaten Michael Jordan in my hay day” and most recently ended with Lavar commenting on what type of pressure Lebron James’ sons will be up against in the future. Now, a lot of these headlines and sound-bytes are just that, but there was a consensus among media members when Lavar started bringing other players children into the equation. After James then warned papa bear publicly in the media, Lavar then doubled down and said he can say and do as he pleases, further adding to the flame and the controversy. Lonzo must be signaling to his Father LaVar. The sad part is that players and the media are not going to take all this out on Lavar, they are going to take it on Lonzo and they are going to do it on the court. Now maybe that’s what he wants. He want’s his son to be the best and he knows there’s a better chance of that happening if he is getting everyone’s best every night. Now we’ve seen loud mouth family members before, but Lavar’s influence is unprecedented. Check out the full interview with Fox Sports’ Chris Broussard “In The Zone” podcast. It’s actually real interesting as he addresses all his comments prior comments. This leads to the LBJ comment that if you listen to in context is actually not that bad, yet still probably crosses the line. You can check out that part at the start of the 46th minute below. Overall, Lavar actually seems like a likable guy, but with the draft right around the corner, it is interesting to see where Lonzo ends up in the draft (most likely 1 or 2 overall pick) and how he does as a professional in the NBA.